This week’s SmackDown! Live is another solid, competent, and refreshing effort. As Kyle Fowle pointed out in this week’s RAW review, that still isn’t quite the norm for main roster WWE programming. SmackDown! Live is still imperfect in some ways—sometimes even aggressively so—but this week’s episode serves as evidence for where it succeeds where RAW doesn’t. It actually gives viewers a reason to tune in by making it clear the show isn’t simply booked on the fly. And it does so with marquee—or even just logical—matches. As much as David Otunga apparently wants it to be true, this week’s main event isn’t the first or even second time John Cena and Dean Ambrose have faced off one-on-one, but it is the first time they’ve done it on SmackDown! Live. It’s also the first time they’ve done it while being closer to equal footing in the ecosystem of WWE, and that’s a really big deal. The Miz and Dolph Ziggler have wrestled each other a couple of hundred times, but the added stipulation (based on the contract negotiations Bryan and Miz have been talking about for weeks) of Miz having to wrestle or risk dismissal guarantees another genuinely good match in this Golden Age of Miz ring work. The show also books a grudge tag match that reasonably doubles as a #1 Contendership match, not because two teams are arguing in the ring and that’s that—because it makes sense even before the show starts. This show basically it pulls off the go-home show for No Mercy extremely well. There are still two weeks of build-up left until No Mercy, so that’s pretty impressive. This is the type of show that makes an audience want to purchase (or at least see, live on the WWE Network) the pay-per-view that WWE is pushing. RAW’s actual go-home show for Clash Of Champions really did no such thing, which is why the comparisons are necessary. WWE is pushing these as two dueling, feuding brands, so let’s talk like they are and that one is clearly winning. Vince McMahon is still the puppet master behind-the-scenes, and every bit of Creative goes through him, but only one main roster WWE show is actually proving to be consistently creative with its storytelling: That’s SmackDown! Live, plain and simple. And when SmackDown! Live even starts in a way that looks like it’s going to veer into RAW territory—you know, making the authority figure the center of attention—it immediately subverts that expectation. As soon as SmackDown! Live opens in Birmingham, AL with a crowd “YES”-ing and Daniel Bryan in the middle of the ring, there’s a split second fear that comes from the show opening with the true “star,” the authority figure who can’t wrestle. Instead, Bryan gets right to the actual focus of the segment and even finds a way to finally be booed (by suggesting a WWE segment be conducted in a “civil” manner) when introducing the contract signing for Becky Lynch versus Alexa Bliss. Now I don’t know if it will set the WWE Universe on fire, but I’d say this opening segment certainly solidifies Becky Lynch as SmackDown! Live’s People’s Champ. The blue brand was obviously smart to make Becky’s first title feud be with Alexa, as both of women are miles ahead of their division-mates in terms of the simple art of acting. This contract signing will surely bring plenty of material for the feud’s No Mercy video package, but Becky’s “not born a champion” speech in particular is the type of character and maybe even career-defining moment that can probably only exist on SmackDown! Live and not RAW. (At least as they are now.) The “reality era” of WWE has often confused being able to cut a passable “worked shoot” promo with actually being good on the mic, to the point where there’s something of a lost art in being able to cut a believable wrestling promo that is simply just a wrestling promo (no pipebomb needed). That’s just what Becky does here with her “not born a champion” speech, holding the Birmingham crowd’s attention the entire time (not a single “WHAT” chant in earshot). Then Alexa responds in kind, finally getting real mic time in the ring and building her character as a heel who has put in the work and clearly has the look (and ability) of a champion. She also has the ability to make Becky doubt herself if she keeps poking and poking and poking. To Alexa, Becky is just a “one hit wonder” (or a “fluke,” as this is one of those wrestling stories), the girl who always came in second or third place and only got lucky because Alexa was the first one eliminated at Backlash. And it’s not just the talking that sells all of this, it’s Alexa’s condescending decision to clock Becky post-“one hit wonder” line, assume she’s finished her off, and then hightail it out of there once she realizes Becky’s not even a little dead. Because when “Becky Balboa” makes a promise to rip her opponent’s head off, she means it. If any of this storytelling sounds somewhat odd to you, it’s simply because it’s the type of regular storytelling the male Superstars have gotten for years. And SmackDown! Live not only allows the women to have it, if it were up to Daniel Bryan (based on Talking Smack), the women (Nikki and Carmella, specifically) would also get the same gimmicks as the men, like a No DQ match. And while the crowd is very much biting when it comes to the story that Becky and Alexa are telling, the Usos’ heel turn is at a strange place right now with the crowd. It’s a turn that’s obviously working in execution, but it doesn’t look like the the live crowds have truly caught up to the fact that The Usos are definitely heel now. This week’s SmackDown! Live does a lot to actually get the live crowds to realize the Usos are no longer the shiny heroes of children they once were, even though they still get the babyface pop when they come out… and when they win, despite all the pain they inflict on Gable. Seriously, they are absolutely despicable in their #1 Contendership match. Not only do they try to destroy Gable’s leg all over again, they immediately follow that up backstage by “jokingly” threatening to do the same to Rhyno and Heath Slater if they don’t just hand over the titles now. They’re mean. And since being mean to Beauty and the Man Beast is basically the worst thing anyone can do right now, the build-up to No Mercy should do well to get them more heat. And on the same note, hopefully Jason Jordan sacrificing himself to save Chad Gable—his “brother”—does well to make American Alpha untouchable babyfaces in the minds of the crowds. They’re just as fired up and pissed off as The Usos are here, only without the malicious streak. Meanwhile, what should be a slam dunk angle between Randy Orton and Bray Wyatt has been plagued both by actual injuries and self-inflicted (by Creative) handicaps to characters. When the angle began, I pointed out how Randy Orton and Bray Wyatt make for an interesting dynamic, based on how fundamentally similar their characters are. It’s something Wyatt has touched on quite a bit in his promos, but the timing of Orton’s SummerSlam injuries prevented them from actually competing one-on-one at Backlash, and Bray Wyatt just had to lose to Kane for some reason. Now that they’re back on track for the match at No Mercy, the momentum is slowed by what happened by Backlash and Bray Wyatt’s ineffectiveness as a character at this point. The slow reformation of the Wyatt Family is also stunting the angle’s growth; even though it’s a smart way to keep the feud going (without Randy and Bray just fighting on SmackDown! Live), it’s not all that interesting. Bray Wyatt’s intimidation factor is nearly nonexistent, but Erick Rowan’s inclusion in the fold (and the lack of Luke Harper, for now) makes that intimidation factor fall into the negative zone. Especially here, as Orton makes short work of the supposedly imposing big man. The fact that Orton and Wyatt could put on a great match is really the only thing keeping this thing together (and maybe also the crowds’ appreciation of this new version of Randy as a sideshow attraction in a hoodie with cut-off sleeves). It all just feels like an unnecessarily long path to get back to Randy Orton having good wrestling matches. On the other hand, “having good wrestling matches” is not something the SmackDown! Live main event scene has a problem with. As mentioned before, this week’s main event is the marquee match of John Cena versus Dean Ambrose, for the first time ever on SmackDown! Live. For the No Mercy Triple Threat match to actually feel like there is a triple threat, each man has to come across as equals. 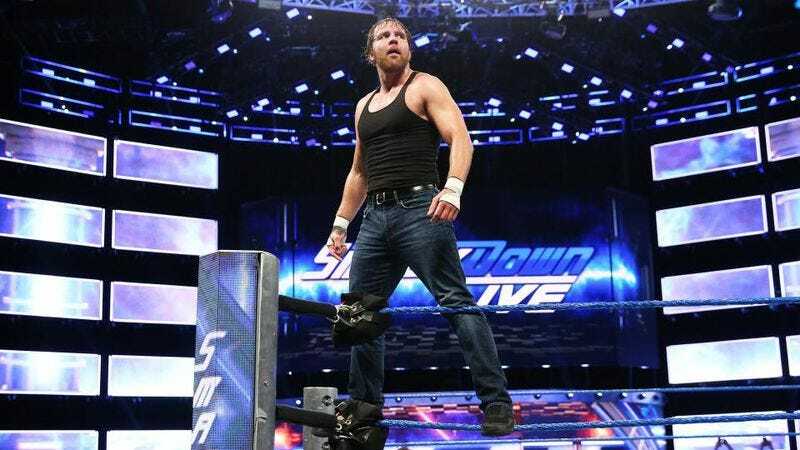 It’s very difficult to truly argue both inside and outside of kayfabe that Dean Ambrose is at the level of a John Cena or an AJ Styles, but SmackDown! Live does a funny thing to at least try to push that narrative: It has Ambrose pin John Cena, clean in the middle of the ring, with a roll-up. Ambrose kicks out of the Attitude Adjustment like everyone else, Cena kicks out of the even more protected Dirty Deeds, Ambrose reverses another Attitude Adjustment attempt into the winning pin, and Cena reacts like he just lost to The Rock at WrestleMania again. If that’s not the type of thing that gives the “casual” audience a reason to watch SmackDown! Live more consistently, then what is? A match that would most likely have ended in shenanigans on the red show ends decisively on the blue one, and that’s that. The Birmingham crowd honestly doesn’t even really know what to make of it—I didn’t even know what to make of it when it happened. But it did happen. And next week, Dean Ambrose gets his title rematch against AJ Styles. Now that one might just involve shenanigans. But hasn’t SmackDown! Live made it so you have to watch, just in case? That’s the whole point. *The “match” begins awkwardly and ends the same. On Talking Smack, Carmella tries to bring up how the DQ makes no sense because of how many matches these days involve wrestlers chucking their opponents into the barricade, but the “match” itself is D.O.A. from the moment Natalya lumbers over to attack Naomi (who’s on her way to her own corner). Naomi’s entrance is longer than the actual match. It’s the one true in-ring blemish on this SmackDown! Live, but it’s also more of a problem in practice than theory. However, Naomi’s backstage promo about “glow” is actually pretty good. But then you get Nikki’s “aww, Trin, you’re so sweet” and all you can think about is how Nikki forgot to be in character in the middle of an interview. Maybe David Otunga will get the chance to tell his Rikishi story (which he started and stopped before, during, and after the Usos’ match) next week, since we’re apparently stuck with him no matter what. Mauro Ranallo, on the other hand, appears to have cut down on the shoehorned pop culture references this week. I wish I could thank him on Twitter, but that ship has passed. Jack Swagger wants the WWE World Championship, and he seems to think going through Baron Corbin is the way to get it. In other news, Apollo Crews not only stopped smiling for the second week in a row, he got mean. “I owe you! I owe you for this!” Throwing Corbin right into the barricade, no disqualification in sight. But let’s face the facts: All three men win just by not being this version of Curt Hawkins. This weekend, when wrestling news is usually slow, WWE used social media well with Daniel Bryan and The Miz taking to Twitter and Facebook to chronicle their contract negotiations. I want to point out this Facebook Live session from The Miz though. The Miz doesn’t just quote Rocky verbatim in this video: He quotes Rocky from Rocky Balboa. Who quotes ROCKY BALBOA? The Miz, that’s who. And while I brought up the Birmingham crowd’s reaction to Cena/Ambrose, I have to point out their reaction to Miz/Ziggler, which was a slightly condensed but still very good version of their Backlash match. When Dolph hits the Zig Zag, the crowd is so sure he’s got it won, they all stand up. It’s beautiful. Have I talked about how much I love the Maryse version of the No Mercy ad? Because I really love it. I don’t know if it exists outside of the Network, but it’s great. I’m very pleased that Talking Smack had Bryan address how it made no sense for Dean to have to wait for his rematch until after No Mercy. I wish he’d called out Shane personally for that particularly nonsensical decision though. Obviously the real life Shane McMahon didn’t come up with that particular booking decision, but in-story, Bryan should question the poor decision-making of a “boss” who is either never around or shows up on his cell phone, presumably in communication with Jeff Winger. Then again, Bryan’s decision-making has turned him into The Authority 2.0 (“Fine print,” Daniel? Really? Really?) so obviously SmackDown! Live isn’t that great.